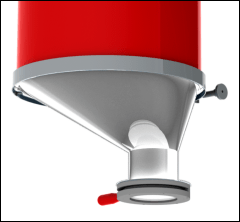 Replace your drum lid with a properly sized Drum Cone to control your	dispensing operation by turning your drum into a precise pouring instrument. Morse Drum Cones and Clamp Collars are available in 16 gauge carbon steel or type 304 stainless steel. you need to reach beyond obstructions at the receiving container. 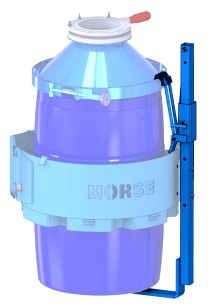 Morse drum cones can be used with many Mobile Drum Handlers and Forklift Drum Handlers. But only an Asymmetric Drum Cone will work with standard Below-Hook Kontrol-Karriers. 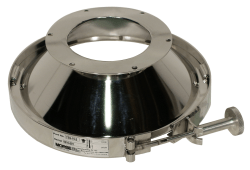 The only below-hook drum carrier that can rotate a drum with a centered drum cone attached is custom model # 185S-LA with longer arms for sufficient clearance within the frame. 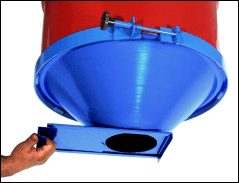 Morse Drum Cones are designed for controlled dispensing of dry powdered or granulated material and to reduce dust while discharging. Dispensing can be stopped almost instantly with a slide gate or iris valve. 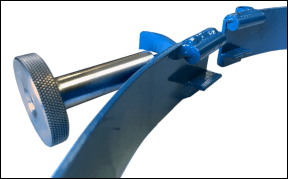 Drum Cones and Clamp Collars are ideal for use with several different Morse drum handlers. Stainless steel drum cone with an iris valve (Model 5SS-IV-45-23) is shown above on a fiber drum being lifted with Model 520-114 Vertical-Lift Drum Pourer. Drum Cones can be used with all Morse Vertical-Lift Drum Pourers, Fork-Lift Karriers, and also with Hydra-Lift Karriers. Special Below-Hook Kontrol-Karriers are available with longer arms to provide the increased clearance required for rotating a drum with cone attached. 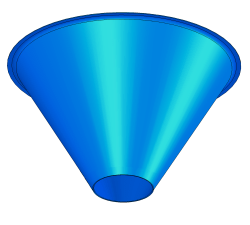 Use Asymmetric Drum Cones with many Morse models, including standard below-hook drum carriers. shown with Iris Valve (kit # IV) installed. 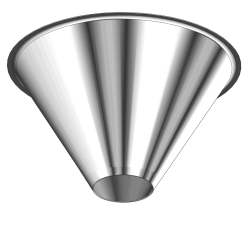 Only an asymmetric drum cone can be used with a standard Below-Hook Kontrol-Karriers. 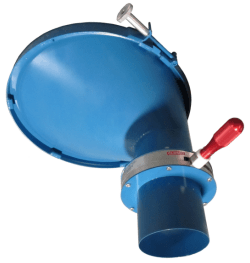 Asymmetric drum cone is shown secured on drum with Clamp Collar (model # 7-23). shown with Slide Gate (kit # SG) installed. 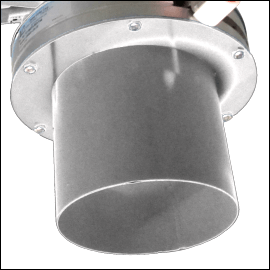 installed on stainless steel cone. Choose the type of valve best for your application depending on the type of product you dispense. Add a Slide Gate to your Drum Cone. 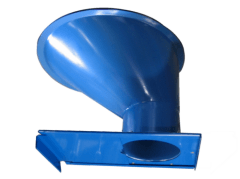 A Slide Gate is recommended for powdered material, but NOT for coarse granulated products. and Stainless Steel Clamp Collar in size # 23 (model # 7SS-23). Add an Iris Valve to your Drum Cone. Iris Valves are recommended for dispensing fine or coarse materials. Iris Valve with aluminum body and 4 oz (.11 kg) nylon sleeve for controlling the flow of fine and coarse materials. The operator revolves the handle around the valve to open and close the flexible sleeve up to a 6" (15.24 cm) diameter opening. A wide range of fine to coarse materials can be handled without clogging the iris valve. Morse Drum Cones are available with a Valve Flange to attach a Morse Slide Gate, Iris Valve, or the valve of your choice. 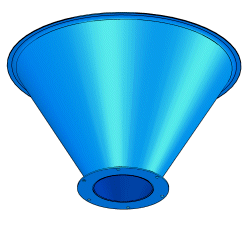 Refer to the Flange Dimension Drawing and Bolt Hole Pattern to ensure your valve will fit a Morse Drum Cone. shown with Stainless Steel Clamp Collar (model 7SS-15.5) to secure the cone to the drum. 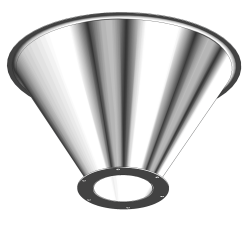 Morse Drum Cones are also available with a 6" (15.24 cm) diameter opening with NO valve flange. 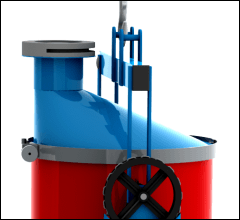 A valve CANNOT be mounted onto a Drum Cone with NO valve flange. Tighten the Clamp Collar around the top rim of drum with the Drum Cone in place. On the inside of the Clamp Collar there are sections of steel rod to retain the Drum Cone, and sections of angle iron to engage under the drum top rim. Tighten the Clamp Collar by turning the knob on the end of the threaded rod. Note: Extension Tubes fit onto a valve flange or an Iris Valve. They are NOT for use with a Slide Gate. IMPORTANT NOTE: When ordering cones or clamp collars, please specify the outside diameter of the top drum rim with the drum lid removed. Remove the drum lid and take several measurements across the rim at various points and calculate the average.